A huge site with 6000+ collectable items such as model cars, beanie babies and trains, 6 chatrooms, a witty shopping assistant and customer order tracking. A large area of the site is dedicated to the Official Michael Schumacher Fan Club, with it's dedicated chat room, and discounted Formula 1 items for members. 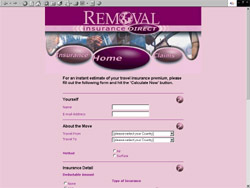 Get an instant, on-line quote for removal insurance. By missing out the middle man, and using the internet to contact clients directly, excellent insurance rates can be achieved. 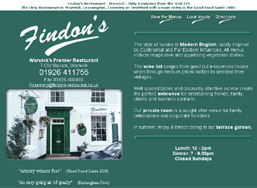 This stunning site gives details of menus available, directions to Findons in Warwick, and photographs of the restaurant interior. This e-commerce site offers, for an annual subscription, full access to a database of select business information. Speed and ease of use are key features of this site. 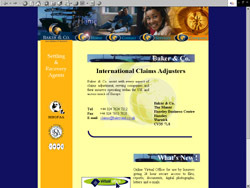 A web site not only to attract new customers for this loss adjuster, but to also offer on-line services to existing customers. Follow the link to the on-line filing system to see a demo of a secure filing system that stores pictures and documents for viewing by authorised visitors to the web site. 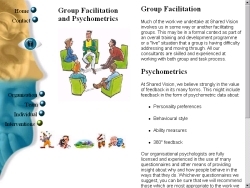 Shared vision is a very attractive website designed as an on-line brochure. 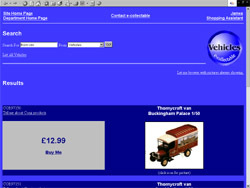 The site required the use of clever positioning techniques to achieve the desired effect, whilst maintaining cross-browser compatibility.